I stumbled into this press release during my morning reading (ParAccel Triples Revenue, Doubles Customers and Appoints New Executive Team in 2010) and felt an overwhelming and immediate need to use it as an educational example in public relations (PR). CAMPBELL, Calif.–(BUSINESS WIRE)–ParAccel, Inc., provider of the world’s fastest analytic database, today announced that it achieved record financial performance in 2010 with 300 percent revenue growth over 2009. The company doubled its customer base with key enterprise wins, launched ParAccel Analytic Database (PADB) 3.0, and continued to expand partnerships with leading platform, storage and analytics vendors. To keep pace with its growth, the company hired key new executives and moved its corporate headquarters to a larger facility located in Campbell – the heart of Silicon Valley. Make supportable claims. The “world’s fastest analytic database” claim strikes me as both unsupported and unsupportable. Different databases are good at different things and there are many analytic database competitors in the market. It is not credible that any one DBMS could be fastest at all of them. But this is supposed to be a PR , not a product marketing, post so I won’t drill further. If you’re going to talk growth, then provide real numbers. Tripling revenue sounds very nice, but from what to what? Many private companies now make these number-free growth claims, but they’re hard to take seriously. Either release real numbers or avoid talking about growth. If you’re going to talk about growth, do the math correctly. Tripling revenue does not equal 300% growth. Think about it: 100% growth = doubling revenue, 200% growth = tripling revenue, so 300% growth = quadrupling revenue. This is a serious credibility blunder and sadly it’s not uncommon. Get a finance person to review press releases with numbers in them. If you’re doubling customers and tripling revenues, then you’ve got me asking questions. People will cross-check your numbers, particularly when you’re providing only pieces of the puzzle and have already made one math blunder. I think they mean to say that they tripled annual revenues and doubled the cumulative size of the installed base (i.e., number of customers). Since I’m not sure what to make of that, I made a little model in Excel. I think what the model tells me is that, ceteris paribus, when you are on a strong growth trajectory doubling the installed base is not enough to triple revenues. I’m sure there are better ways to analyze this, but that’s not my point. My point is, as a marketer, when you are providing only pieces of the puzzle you are hanging yourself out to dry if those pieces are inconsistent or provide a clue to a less rosy bigger picture. By the way, my guess, based on playing with the model below, is that the company had a weak trajectory in 2006-2009 and then had a nice 2010. Don’t say “exponential growth” if you don’t know what it means. I love the data warehousing market. It is large, growing, and healthy — but it is not growing exponentially. Exponential growth has a precise meaning. The data warehouse market is growing at a 12% (linear) rate and will $13.2B by 2013. That’s huge and wonderful already. Saying the growth is exponential just damages credibility and undermines an otherwise very strong message. Say “Appoints New Executives,” not “Appoints New Executive Team.” The new CEO joined in August, so that’s not news. The company has appointed a new COO, CMO, and VP of International. Those are important roles and should be announced. But the headline makes it sound like the board blew out the entire executive staff and replaced them in one shot. This is not only a non sequitur (i.e., “we’re doing so well we fired everyone”), it’s also inaccurate. Be careful in expectations management. While I just love the “energized” comment (i.e., were the old guys tired?) my real issue is that the company is saying that 2011 will be better than 2010. They shouldn’t say this unless they plan to more than triple revenues in 2011 and more than double the installed base. Logically, anything less would then be a disappointment. To keep pace with its growth, the company hired key new executives and moved its corporate headquarters to a larger facility located in Campbell – the heart of Silicon Valley. Be credible. 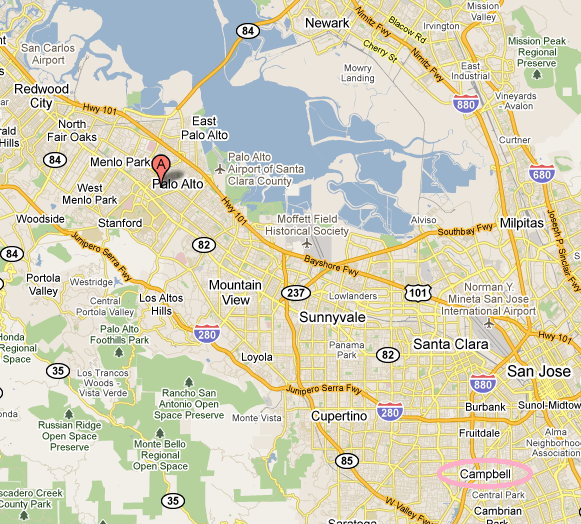 Unless I somehow misplaced Bill and Dave’s Garage, Palo Alto is the heart of Silicon Valley. In 25 years in and around Silicon Valley, never before have I heard Campbell referred to as its heart. C’mon. Reminder: see my FAQ for relevant disclaimers. The map is useless without a scale for anyone who does not know that area of the world. I checked Webster’s: ” guesstimate” is a real word. Sorry, I didn’t know how to embed as a live object [which would have enabled you to see a scale] and, for what it’s worth, San Jose *International* Airport is clearly labeled as such. Moffett Field, by the way, has 9200 foot runways and for your interest is where Google’s founders get to fly in and out on their private 767. But I get your point. Happily it wasn’t a post on visualization. By the way, it’s 20 miles and here’s a link to a live map. I was expecting people to bust my chops on whether Palo Alto was indeed the heart of Silicon Valley, not how far away Campbell was. If I want to nitpick myself, I’d say that Palo Alto is clearly the birthplace of Silicon Valley but heart is a little less clear. For those outside the area, Silicon Valley is more a metaphor than a precise region — e.g., there is no Silicon River carving out the Silicon Valley. I just realized I forgot my manners. I think that this is a great piece and enjoyed reading and learning from it. This brings back a painful memory circa 2001. Business Objects announced some sort of generic love for XML for Analysis from Microsoft. We put out a press release and low and behold a journalist asked to speak with you, as you were quoted in the release. Later that day an article appeared and I, as the product marketer, felt that you were slightly off message. In my naiveté, I called you on it. I believe you referred to the release as “weasel worded” and tore me a new #%$hole. Good times! I’m pretty sure you reviewed every release in detail that…especially the ones that had anything to do with our wonderful OLAP strategy. This is a great article for PR, but ultimately much of this comes down to the importance of strong product marketing. I wonder if the product marketers at ParAccel even had a chance to review this release before it went out. Good point Darren. It’s possible that neither finance nor product marketing got to have a look at the release. That said, “the world’s fastest schmumble” seems to be their core positioning — it’s their corporate soundbite and in their boiler — so the unsupportable nature of that claim is clearly in product marketing’s zone. Dave, I enjoyed the article and will agree the press release you cited is poor. However I will quibble with you on a couple of points. According to the Wikipedia entry on exponential growth that you linked to, “Exponential growth (including exponential decay) occurs when the growth rate of a mathematical function is proportional to the function’s current value.” If the data warehouse market is growing at 12% per year, to use your example, then the market size T years from now will be (1.12)**(T) times the current market size. That function qualifies as exponential growth according to the Wikipedia article, with which I agree. The word exponential, although accurate, should have been left out of the press release because it adds no value. I would say the same thing about the “heart of Silicon Valley.” If I understand correctly, they moved their headquarters from San Diego to Campbell, which in my book qualifies as having moved to the heart of Silicon Valley. Nevertheless I would have removed “heart” because it looks so weird to those in Silicon Valley. Thanks for your comment. By golly, I think you’re right mathematically. So I’ll have to fall back and agree that I still wouldn’t use it because the base is so small at 12%. For example, a $1M with “exponential” 12% growth takes 23 years to get to $13M. But, it is indeed exponential.